Healing Presence and Applied Ayurvedic Studies with Shanti Shanti Kaur Khalsa PhD and Vijaya Stern ND. Cortez, CO. Pain Care Yoga Mentoring with Neil Pearson PT. Honolulu, HI. Healing Relationships (integration of Yoga Therapy within the medical community) with Nischala Joy Devi. Encinitas, CA. Thai Yoga Therapy (acupressure, assisted yoga, holistic healing practices) with Saul David Raye and Gigi Chiarello. Ojai, CA. Pain Care Yoga (Level 1) with Neil Pearson PT. Vancouver, Canada. Functional Yoga Therapy (Assessment Techniques, Somatics and Range of Motion Testing) with Maria KaliMa RN. Tucson, AZ. Yoga of the Heart® (Heart Disease, Cancer and Chronic Illness) with Nischala Joy Devi and Bhaskar Deva. Buckingham, VA.
Yoga of Recovery for Counselors® (Ayurvedic approach to addictive and self-destructive behaviors) with Durga Leela and Swami Sitaramananda. Grass Valley, CA. Trauma Sensitive Yoga and Frontier of Trauma Retreat with Dr. Bessel van der Kolk, David Emerson, Jenn Turner LMFT, and Dana Moore LPCC. Stockbridge, MA. Yoga for the Nervous System: Chronic Stress, Anxiety & Insomnia with Bo Forbes PsyD. Stockbridge, MA. 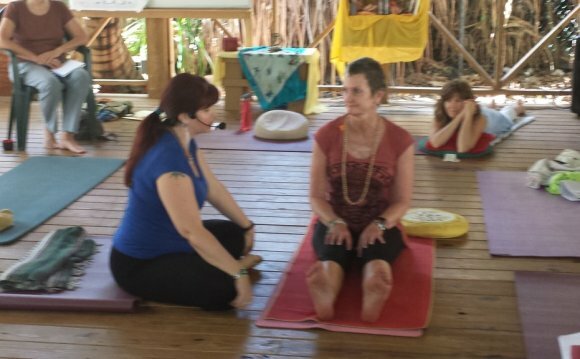 Therapeutic Alignments for Strength & Flexibility (Anusara inspired) with Johanna Holloman. Carmel, CA. Yin/Insight Yoga silent retreat with Sarah and Ty Powers. Stockbridge, MA. Shannon Massie Eisner is a member of the International Association of Yoga Therapists, Yoga Alliance, and the International Coach Federation.